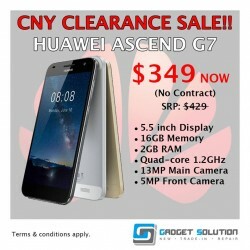 Enjoy CNY Clearance SALE for Huawei Ascend G7 for only $349, enjoy another further $20 discount.They will also be throwing in a free screen protector and casing. That is just $329 for a brand new smartphone with screen protector and casing. What are you waiting for. Head on down to any of their 5 outlets to get yours today.